Freesia flowers are known for both their sweet aroma and vibrant, eye-catching colours. There's nothing quite like a bouquet of fresh freesia to evoke the feeling of a warm summer's day and to bring the splendour of nature into your home. If you're looking for a bouquet of summer flowers to celebrate a special occasion such as a birthday party or anniversary taking place over the summer months, you can never go wrong with an arrangment of fresh freesia! 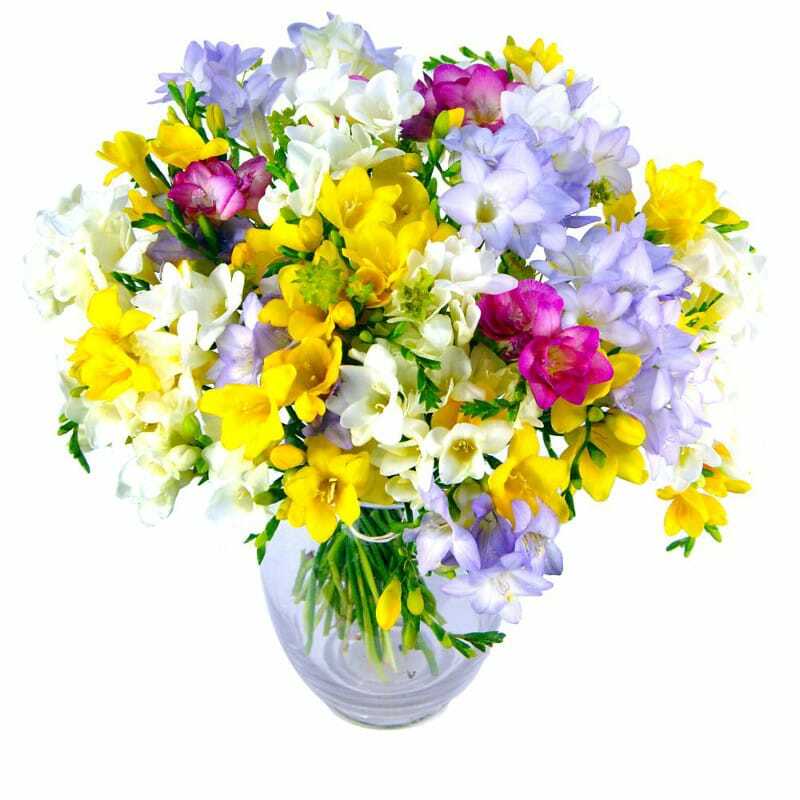 Our renowned Freesia Fragrance bouquet is a multi-coloured explosion of floral beauty which exudes a splendid scent. Featuring a total of 40 stems with pinks, yellows, whites and lilacs, this spectacular arrangement will make for an unforgettable gift for a loved one. Alternatively, why not treat yourself? The Freesia Fragrance would make for a fine centrepiece in your living room or dining room which would be sure to attract attention and admiration from visitors to your home. For a limited time only we're offering 20% off the Freesia Fragrance bouquet, a saving of £7 off the usual price of £34.99. For just £27.99 you can have this lovely bouquet delivered direct with free delivery included as standard. For an extra £5 you can upgrade to a deluxe version of the bouquet which gives you 25% more flowers. If you are sending Freesia Fragrance as a gift don't forget that you can add all sorts of optional extras from chocolates to a handwritten card. The order process couldn't be easier; simply choose your delivery date, specify the recipient's address and then sit back and wait for your fresh flowers to arrive!